Each week I try to do one new activity with the kids that takes extra effort on my part as a mother. This usually means a trip to the store for supplies, and spending extra one-on-one time during the activity. This is also a time to let the kids be messy and participate in fun sensory activities. Last week was super fun, we did some fun activities with water beads, and the week before we did a wall mural painting in our kitchen. This week we decided to make our own slime. Because it only takes two minutes to make, we ended up doing this 3 different days. 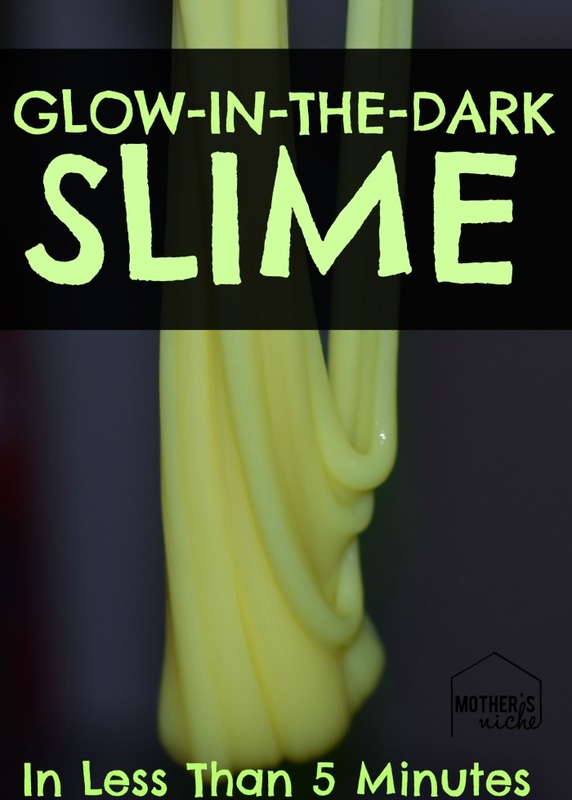 The first day we had some sensory fun with the slime, the second day we made slime monsters (more about that on my Glitter Slime Post), and on the 3rd day we made glow-in-the-dark. Pour your glue into a bowl. Add some glow-in-the-dark paint (1-2 Tablespoons until it’s the shade of color you want). Mix the glue and paint together really good and then start adding the liquid starch (add 1-2 Tablespoons at a time and mix it together good). Near the end you will need to knead it with your hands until it reaches the desired consistency (we like it at the just past sticky stage).